The whole concept of Memebox was always going to be a winner for me- a surprise selection of high quality Korean beauty products all packaged up in a little pink box. I don't think it could be more appealing if it tried! I've had a few Memeboxes now and have loved every one of them; I've got to try products that I'd have never come across any other way, and have discovered some amazing innovative formulas and ingredients that you just don't see here in the UK. The latest box I received was a Memebox Superbox (their Superboxes contain all full sized products) based on the theme 'My Cute Wishlist. Oh yes, just when I thought it couldn't get any better they release a box containing this adorable bundle. This is a deep-cleaning foaming cleanser, and works a treat at removing any traces of oil and makeup. It's very powerful and so you only need the tiniest amount, I can safely say it gets rid of everything on your face (even mascara) with no problems whatsoever. It claims to give the best 'down to the pore' clean, extracting blackheads whiteheads and acne causing bacteria- I don't know about you but I find that extremely satisfying. I notice that my skin does feel a bit stripped after using this, but followed up with a hydrating moisturiser it was completely fine and had no negative effects on my skin. This definitely wouldn't be one for dry or very sensitive skin types, but if you have oiler skin or like to have something on hand to give your skin a deep clean every once in a while then this is the stuff for you. The obvious question here is how do you wear a face mask to bed without it ending up all over your hair and pillow? But the product kind of 'sets' onto the skin; it's flexible enough that you can still move your face, but sets so that it's no longer a creamy/ sticky consistency. In the morning you wash it off as you would with a normal face mask, and are left with nice smooth and hydrated skin. It contains an amazing 52% natural collagen, which would be especially great if you were targeting wrinkles and fine lines. I'll admit I do love the novelty of this as I haven't tried anything else like it, but it really does leave the skin feeling nice too. This is the fourth Rose Mine product I've tried now, and it's entirely thanks to Memebox as I doubt I'd have discovered this brand on my own. I've loved every product from them so far and this is no exception. None of the Rose Mine products I've tried have had a particularly strong 'rose' scent (this is more of a very light, sweet floral) and so if you're not a fan of rose scented products it wouldn't be a problem. The packaging of this is so pretty, I've put it straight into my handbag for use on the go which I'm sure will be handy over the autumn and winter when dry hands start becoming a problem. Oh joy! I've never seen a lip mask like this before and can't wait to bust this open and give it a go. I've used dissolvable face masks so am aware of the concept, but just never one targeted for lips. You leave it on for twenty minutes and the ingredients inside absorb into your lips- I'll definitely be keeping this for a full on pamper sesh in a few weeks time! The lip balm is probably my least favourite product in the box. It's still an ok product by all means but is a bit on the sticky side for me. I'm sure I'll use it up, but I have other lip balms that I prefer. This has to be my favourite item, and is definitely the thing that caught my eye when I first opened the box. 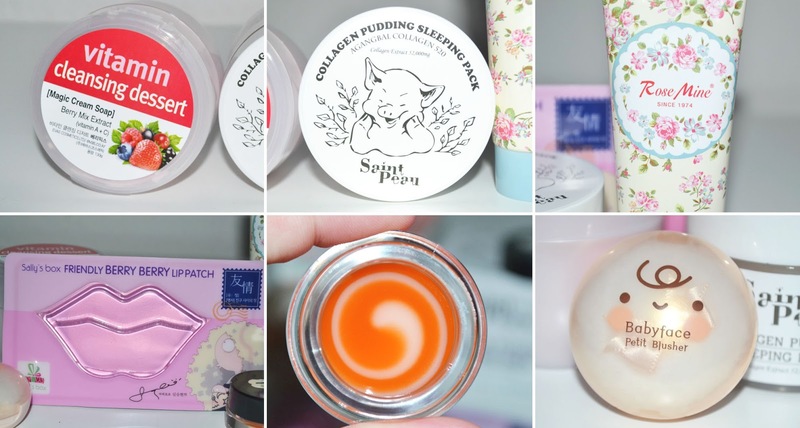 The packaging is absolutely adorable, and although it's a full sized product it's still quite small so is ideal for popping into a handbag or travel bag. The packaging is similar to Etude House's Cookie Blushers with the cute rounded case and a pretty powder puff inside, and the colour is beautiful too. Of the four shades available I'm glad I got this one, it's a light muted peach that would probably be a nice highlight on deeper skin tones. The formula is silky smooth and just feels like a high end product- a full review of this will be coming up soon. What do you think of the contents of this Memebox? Awww this box looks amazing. I would love to try every single product. Oooh, what an amazing box! I've just received my MeMeBox "Scrub Box" yesterday, and can't wait to try & review everything! This is actually super adorable! This seems like a great gift idea for a friend of mine! I really love MemeBoxes. I ordered the "My Cute Wishlist #3 & #4" and I can´t wait for them to get here. I´m sad that I missed the first two boxes. It's a perfect box name - the contents is so CUTE! I've ordered the Cute Wishlist #3.... hurry up Memebox! !